Dubai, UAE (September 24, 2018) – Baldinini, the Italian luxury footwear and accessories brand, releases its Fall Winter 18/19 collection in UAE, marking the elegance of the 80’s with strong details from the daily wear to the most elegant mood, from the trend to casual, and sports to the coolest sneakers. Singular feminine, Feminine by definition, singular by vocation, the Baldinini materials and constructions with a strong fashion imprint have been chosen: calfskin, nappas, patent leather, and suede. The Baldinini FW 18/19 collection is rich in bright materials, multi-colored metallic patterns and rich variations of gold and bronze. 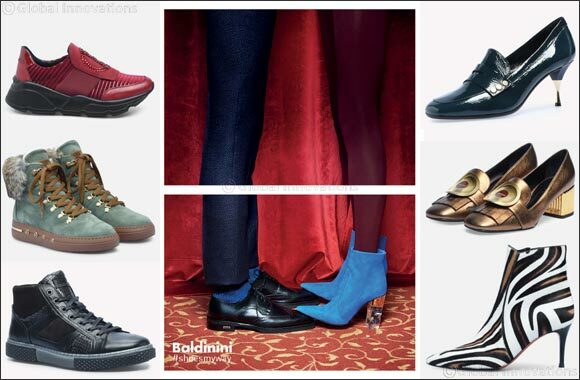 Boots have always been a part of Baldinini DNA: the brand outlines multifaceted versions, all with a glamorous accent. The colour palette goes from cherry red to rust to brown with flame red bursts. The new cowboy boots are the protagonists: double-coloured, with animal print or in an unprecedented total black thigh-high version. Baldinini sneakers are perfect to match a casual and laid back looks but they can play down more formal outfits. They become the key piece for a wardrobe high in style. The most structured versions are elegantly built and come in quality leather with stitches and inner fur to guaranteed comfort and a flawless fit. Enjoy the new season with Baldinini’s Fall Winter 18/19 collection. Discover the entire collection at The Dubai Mall, Wafi Mall, Burjuman Center and Yas Mall in Abu Dhabi.